On the evening of February 4th Chancellor Hua presented diplomas to Mahn-chi Foung and Grady Whitfield-Reaves naming them clinical assistants in the field of acupuncture. The students are graduates of Dr. Grace C. Liu, M.D. and licensed acupuncturist whose clinic is located in the hospital at the City of Ten Thousand Buddhas, Talmage, Ca. 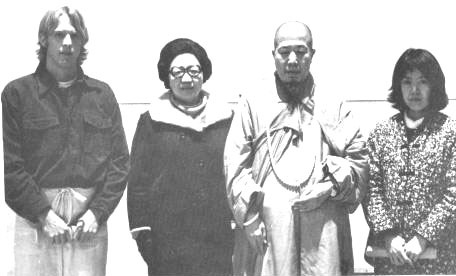 Shown above are Chancellor Abbot Hua (center right) and Dr. Grace Liu (center left) flanked by Mr. Grady Whitfield-Reaves and Ms. Mahn-chi Foung following the awarding of acupuncture diplomas from Dharma Realm Buddhist University. There are some doctors who cure people's illnesses; there are some doctors who kill people. How do they kill? They use people as subjects for research and experimentation. It doesn't matter whether they recognize a patient's illness or not, they give him a dose of medicine and watch to see what happens. If the patient gets better, they know that the medicine they chose cures that kind of illness. If they patient does not improve, they consider it none of their business. So if you talk about them in their worst aspect, some doctors kill people. They give their patients chemicals to ingest by way of experimentation and it is very easy to kill the patient this way. There are other doctors who clearly know how to cure an illness Quickly, but who deliberately prolong it. Originally the illness could be cured in one visit or at the most three, but the doctor extends it. From the three it would take to cure the patient he uses thirty visits instead and still the patient is not well. Why does he do that? The longer he keeps the patient, the more money he gets. If he cured your illness right away he wouldn't have any income. Doctors of this sort are only looking out for themselves, they do not consider their patients. Dr. Grace Liu, on the other hand, wants her patients to get well quickly. She uses her best methods to cure their illnesses, even to the point that though she may not have money to use, she pays no attention to herself. What proof is there of this? She has now trained two students and doesn't fear that when the students are taught the teacher will starve. Think of the population of this locale and you will realize that one doctor doesn't have a lot of patients. Now there will be three people practicing and imperceptibly Dr. Liu's potential patients will be divided among them. But she pays no attention. She has two students and so she has taught them what she knows and today they are graduating as clinical assistants. Dr. Liu's primary hope is to have "transformation bodies" so assist her with the patients she herself can't finish seeing. So Mr. Reaves and Ms. Foung should adapt her principles. Don’t be like doctors whose principle interest is money or doctors whose principle interest is experimentation. You should take the curing of disease as your principle. What a coincidence that on the evening of your graduation, the Avatamsaka Sutra text discusses the Great King of Physicians! You couldn't have chosen a more appropriate night for graduation if you'd tried! So you should all be great kings of physicians and cause those with fatal illnesses not to die. Some doctors kill, you should bring people to life. I don't know if what I've said is correct or not, but I've said it whether you like it or not. If you remember what has been said this evening, it will be ever useful to you as doctors.